Three plots in three different historical periods—prehistoric times, Ancient Rome, and modern times (the Roaring Twenties)—are intercut to prove the point that man’s love for woman has not significantly changed throughout history. In all three plots, characters played by the small and slight Buster Keaton and handsome bruiser Wallace Beery compete for the attention of the same woman, played by Margaret Leahy. Each plot follows similar “arcs” in the story line in which Keaton’s character works for his beloved’s attention and eventually wins her over. 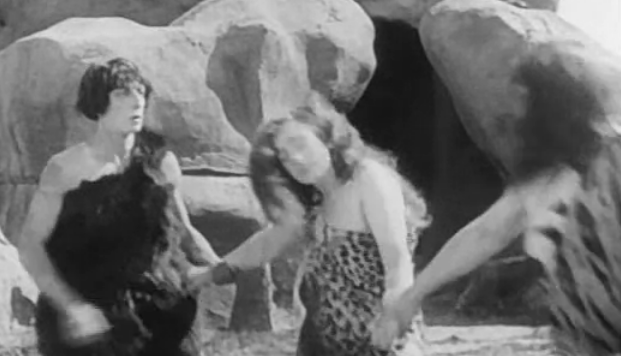 In the Stone Age story line, Keaton competes with the bigger, brutish Beery for a cavewoman Leahy. After observing another caveman drag away a woman by the hair in order to “claim” her, Keaton tries to become more assertive, but is continuously pushed back and bullied by Beery. An attempt to make Leahy jealous by flirting with another woman ends in failure. Nevertheless, Keaton grows closer to Leahy, and Beery challenges him to a fight at sunrise. Keaton wins thanks to hiding a rock in his club, but is caught and tied to the tail of an elephant to be dragged around the dirt as punishment. Upon his return, he finds Leahy about to be claimed by Beery and attempts to make off with her. Beery catches him and the two battle by tossing boulders at each other from afar, with Keaton and Leahy on a cliff together. When Beery climbs up to reclaim Leahy, Keaton dispatches Leahy’s cronies and finally defeats him. He drags a smitten Leahy off by the hair. In the epilogue, they go off for a walk with their huge family of children following them. In the Ancient Rome segment, Keaton attempts to attract the attention of the wealthy Leahy, but is continually pushed back by Beery. Beery challenges him to a chariot race after a hard snow — Keaton wins by using sled dogs instead of horses. In revenge, Beery forces him into the lion pit belonging to Leahy’s family. Keaton survives by befriending the lion and cleaning its claws. Keaton is rescued by Leahy’s parents while Beery kidnaps Leahy. Keaton rescues her and tries to seduce her in her palanquin, which takes off without them. In the epilogue, they also go out for a walk with many children in tow. In the “modern times” story line, Keaton is a poor man yearning for Leahy, who has rich parents. Leahy’s mother, unimpressed with Keaton’s bank account but interested in Beery’s, decides on Beery as a match for her daughter. Keaton accidentally gets drunk at a restaurant where Beery and Leahy are dining, and Beery tricks the male half of another couple into punching Keaton, who stumbles home drunk. Later, Keaton impresses Leahy by playing a football game, whereas Beery is only a coach; Beery decides to play opposite Keaton. Keaton is overwhelmed by the bigger Beery, but ends up winning the game with an impressive touchdown. An irritated Beery frames Keaton for possession of alcohol and gets him arrested, simultaneously showing him a wedding announcement between him and Leahy — Keaton will be unable to stop the wedding while in jail. While shadowed by a guard, Keaton finds a criminal file showing that Beery has been charged with bigamy and forgery. He attempts to call Leahy to warn her. He accidentally escapes when the phone booth he’s using is taken out for replacement. Keaton evades the police chasing him and make it to the church on time, dragging Leahy away from the wedding and into a cab. After showing her Beery’s criminal file, he takes Leahy home and prepares to leave, but she kisses him. He declares to the cab driver that they’re going back to the church. In the epilogue, they also go out for a walk — this time with their dog instead of children.